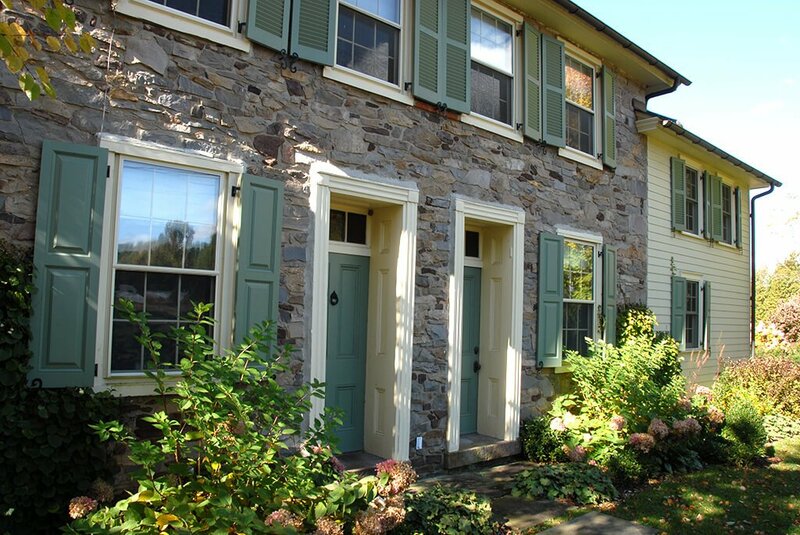 There is something innately charming about the combination of cozy, warm stone and a set of complimentary shutters. 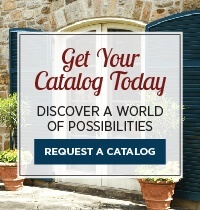 Rustic farmhouses can provide the perfect backdrop for a pop of color, a brilliant white or a well-matched neutral. 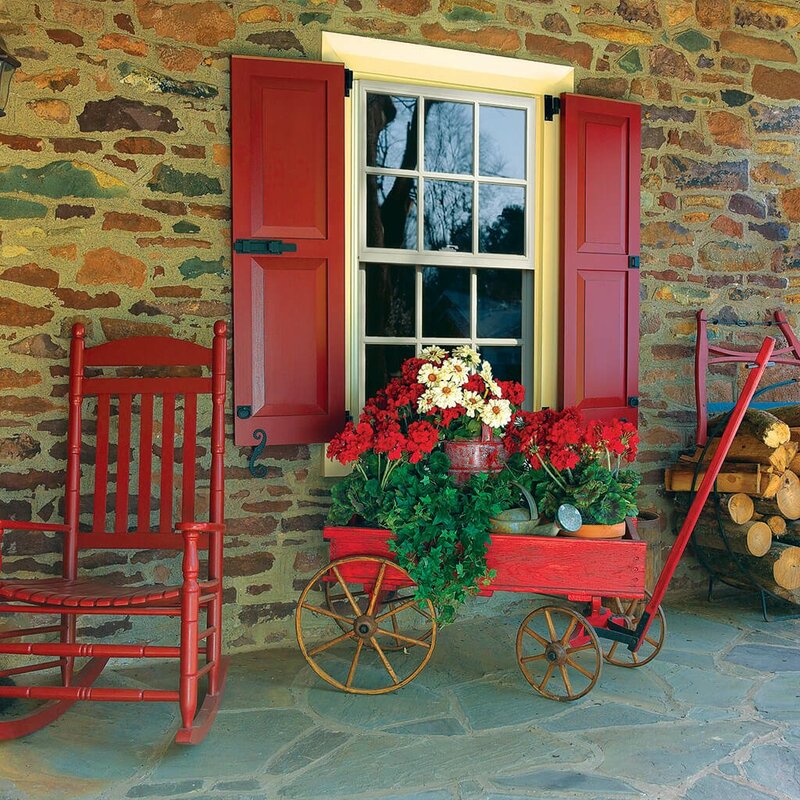 Old meets new, and country charm meets modern touches in perfect harmony with these Timberlane shutters. 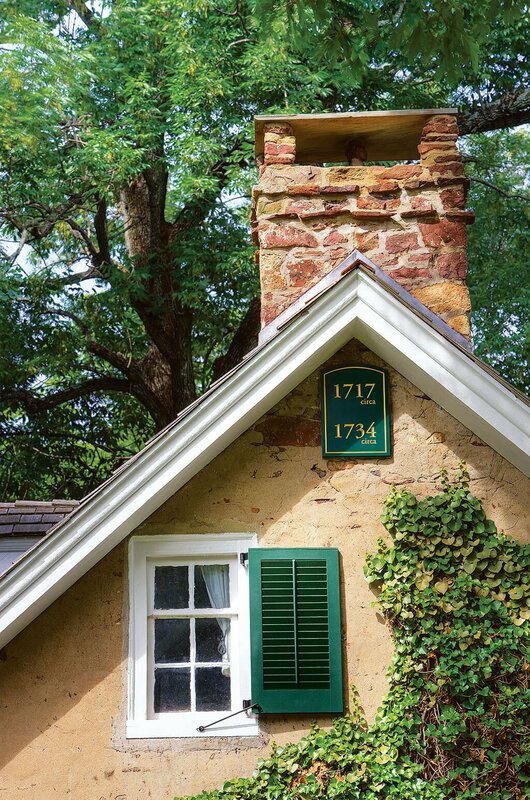 Cottage-inspired charm is achieved through these radius top board & batten shutters finished with delicate hardware and a coat of custom green paint. 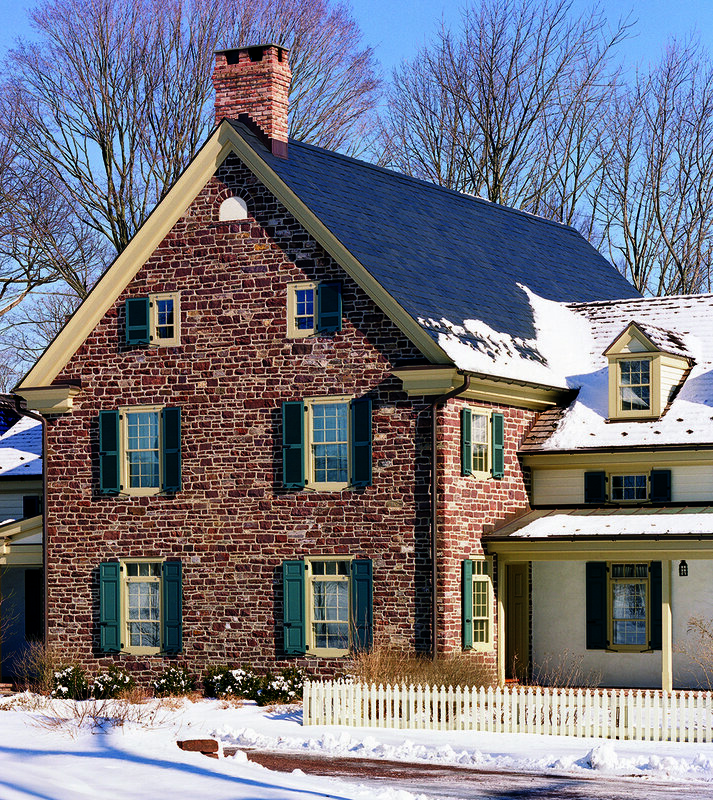 This Colonial hosts a variety of shutters to match each window: a radius top shutter for the arched window; short, single shutters for small windows; and basic, fitted shutters for the first floor. 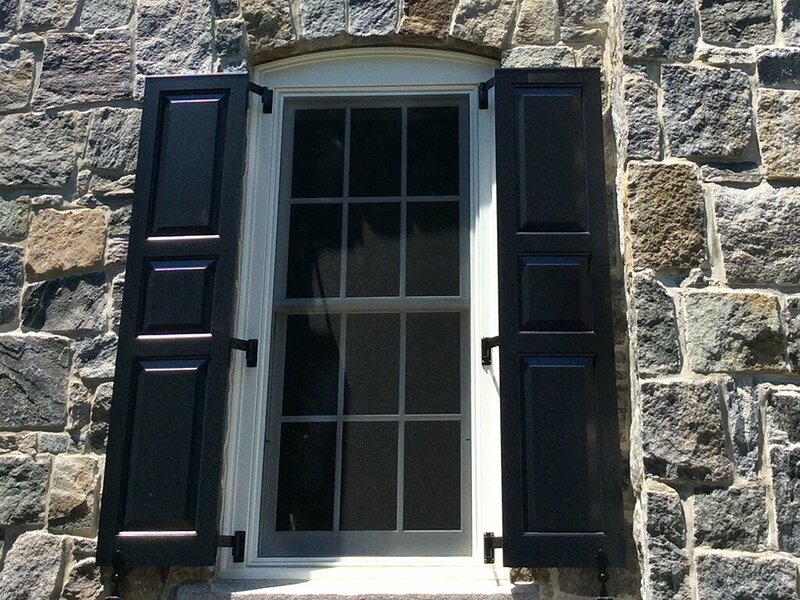 This stone Colonial looks stunning with black panel shutters in a 40/20/40 configuration and fully operable, traditional hardware. 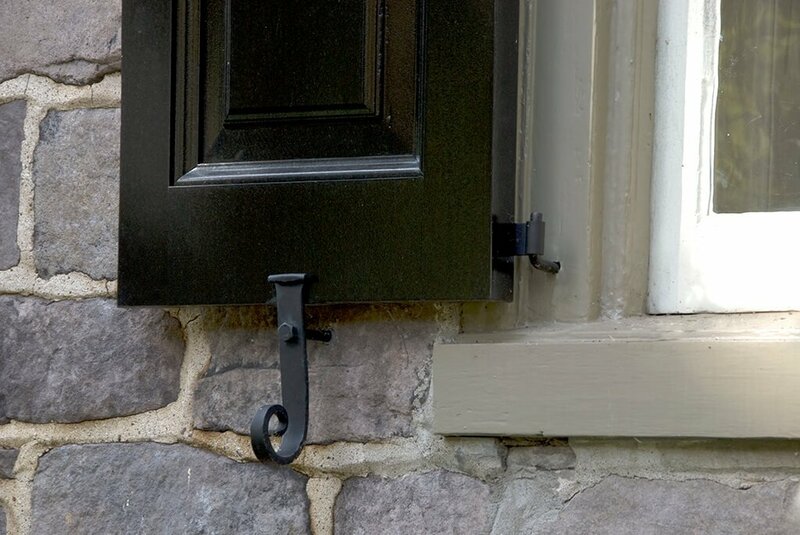 Detail shot of black Shaker panels with quarter-round trim in a 40/20/40 configuration attached with plate pintels and finished with Belmont tiebacks. 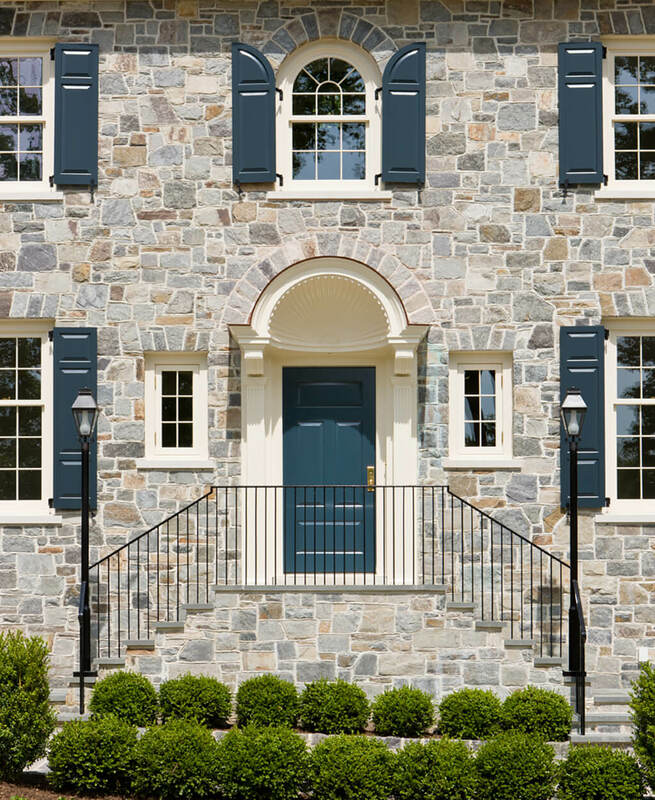 This stone home features a variety of panel shutters in Colonial Times Blue, including a radius top shutter for an arched window and custom-designed configurations on both 2- and 3-panel shutters. 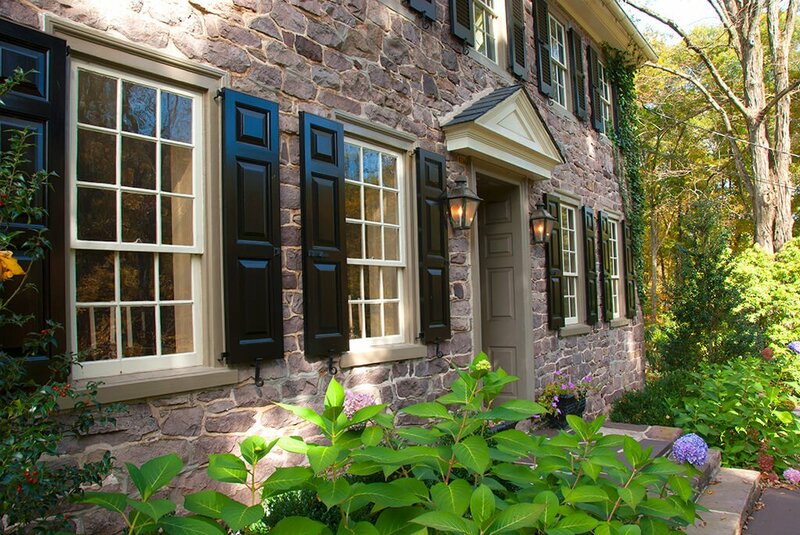 This handsome stone Colonial features black panel shutters with configurations tailored to each window and fully operable hardware. 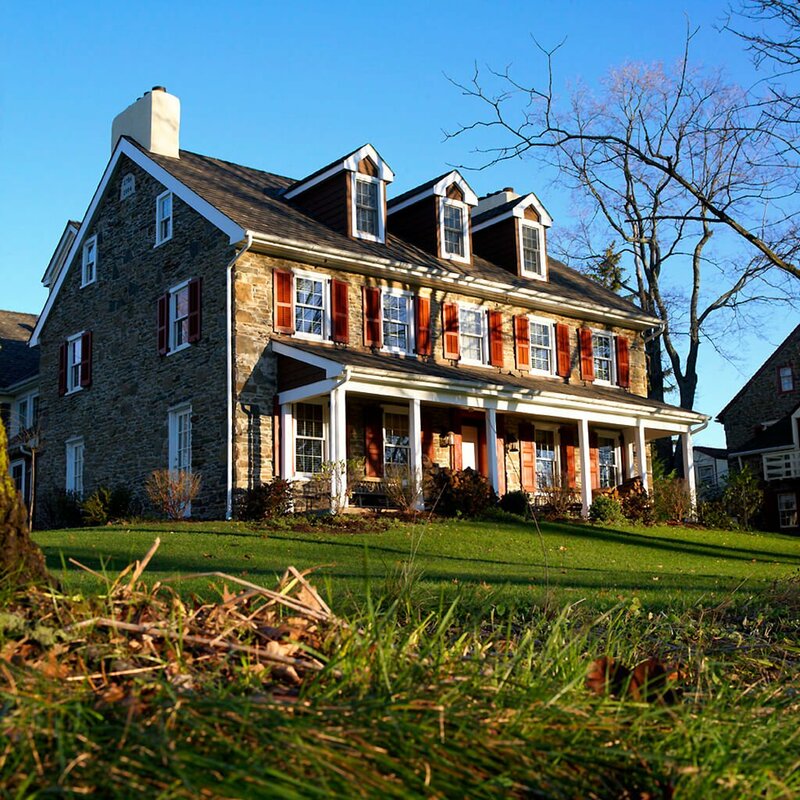 A classic Colonial home features louver shutters on the second floor and standard raised panel shutters in a 20/40/40 configuration, finished with slide bolts and rat tail tiebacks. Detail image showcasing Pitch Black panel shutters finished with rat tail tiebacks. 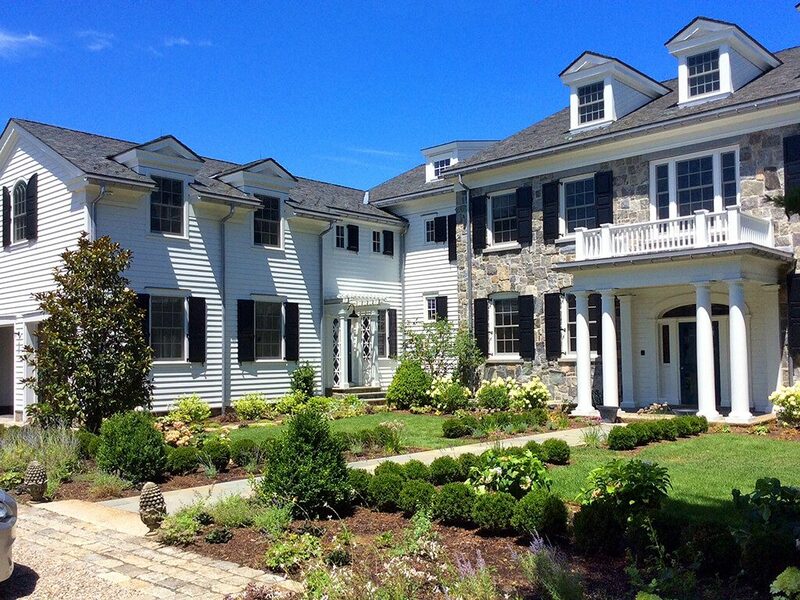 Perfectly matching shutters to each type of window as with this home creates a cohesive, tailored effect. 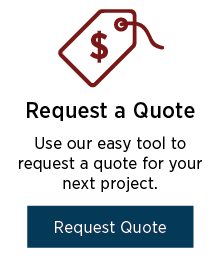 The panel configurations align with the window panes: exactly matched on all three levels. 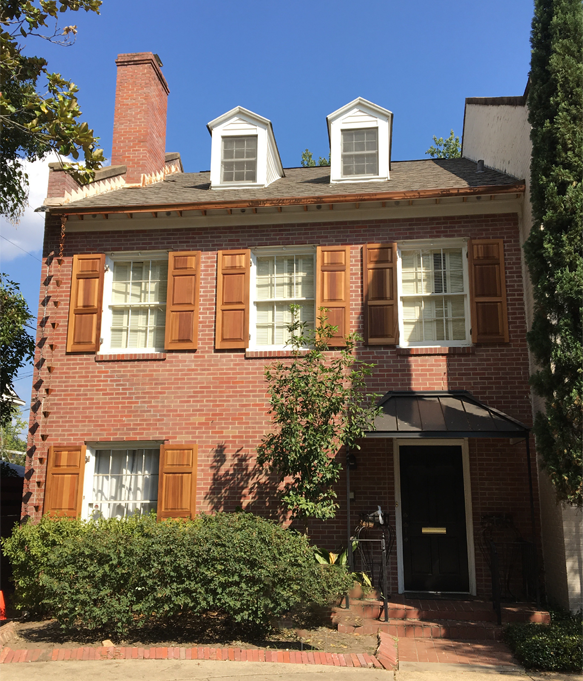 This historic home features a tiny attic window and perfectly fitted operable louver shutter, finished with a traditional sill mount and painted vibrant Emerald Green. 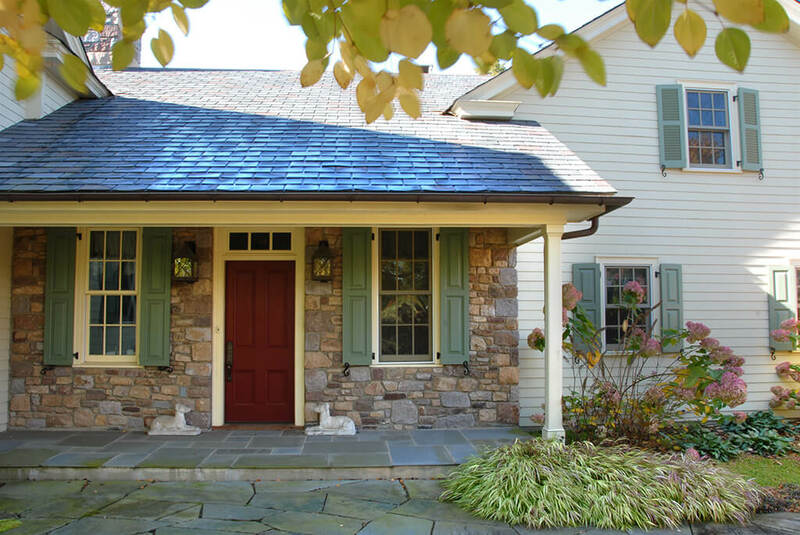 This lovely stone home is beautifully complemented by a dark wood details and Sage Green board & batten shutters to match the trim. 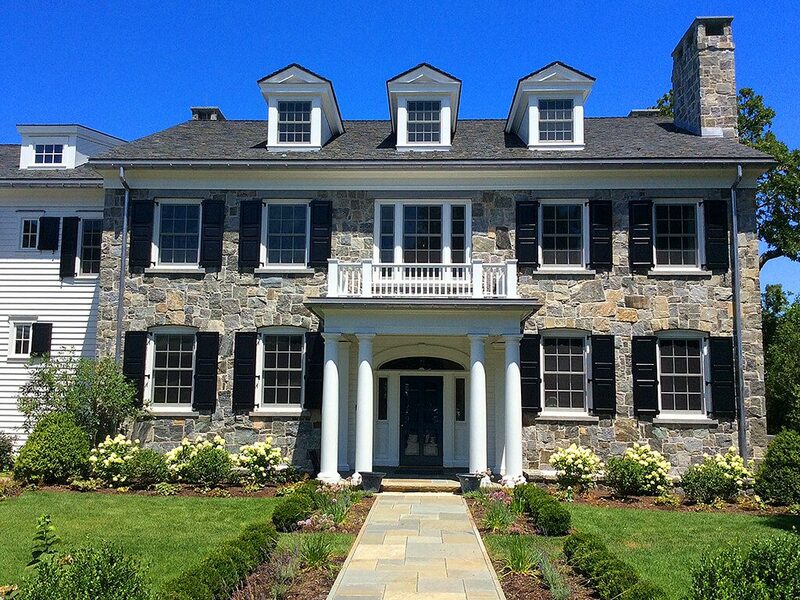 This stunning stone home takes a unique approach by mixing black shutters on the second floor with white shutters on the ground floor. The black and white scheme of this stately yet welcoming portico extends throughout its shutters: black louver shutters dress the top windows and raised panel shutters in white line the ground floor. 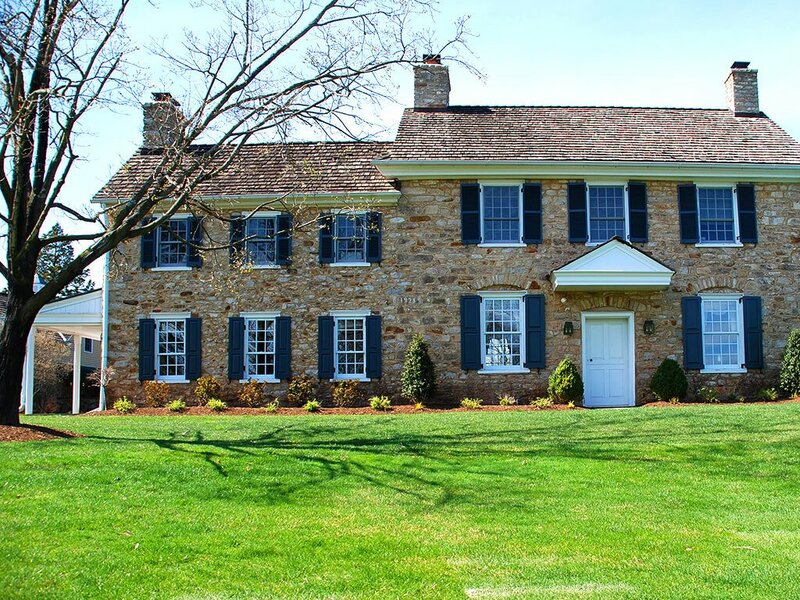 The tan stone, dark roof, and white siding & trim of this lovely home are perfectly complemented by black louver shutters on the second floor and white panel shutters on the ground floor. 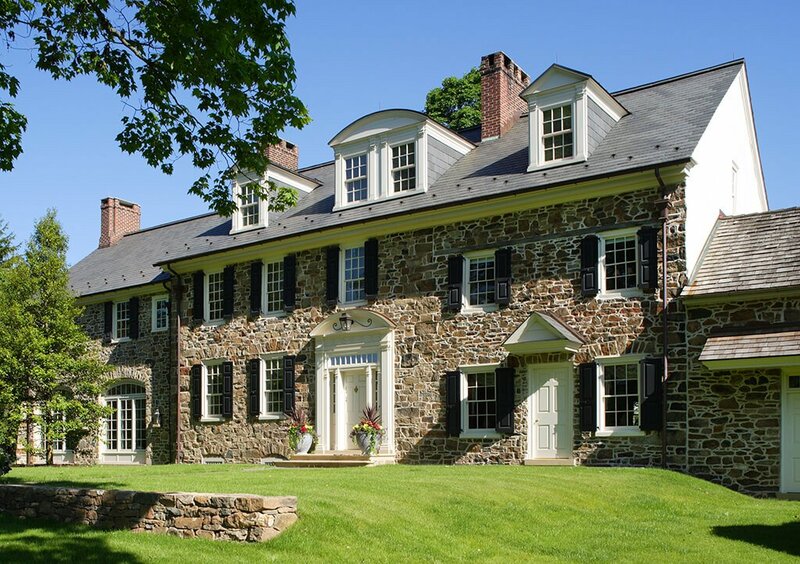 The ground floor of this gorgeous stone home sports white paneled shutters in a 40/20/40 configuration, while the arched window above is fitted with a radius-top louver shutter in Pitch Black. 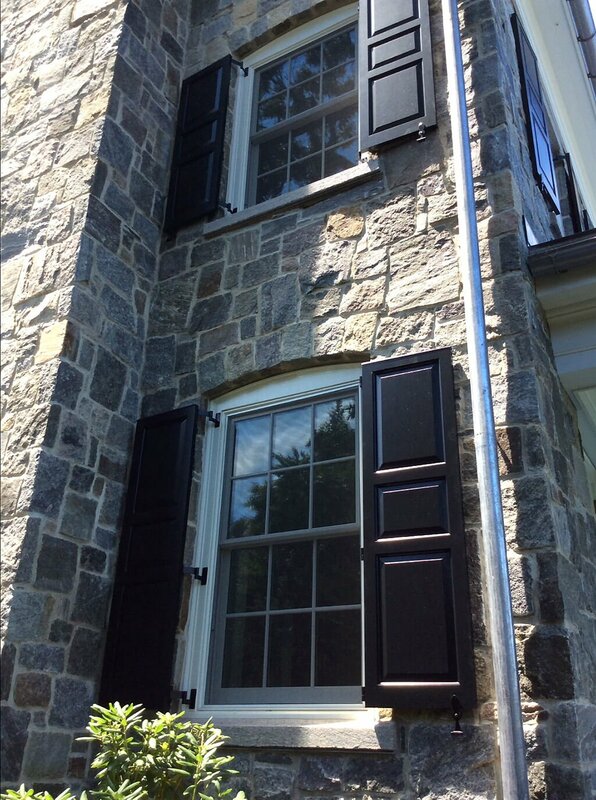 Tall, narrow, raised panel shutters flank the door; smaller, matching shutters to the right; fixed louver shutters in the same hue are seated above – all perfectly fit to open and close. Green raised panel shutters pair with fixed louver shutters, both in 50/50 configurations and finished with “S” Floral tiebacks. The fixed louver shutters above and raised panel shuttters below create a cohesive look with the doors painted in a custom-matched color. 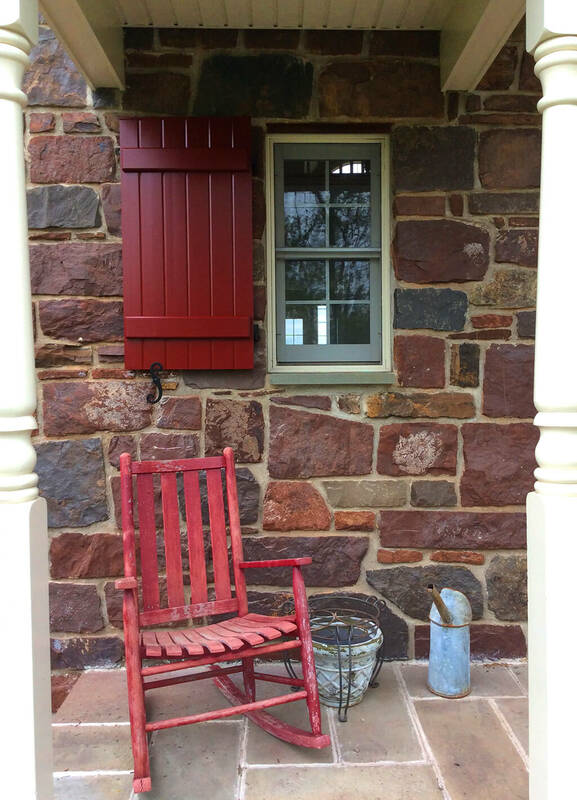 Deep red board and batten shutters lend just the right pop of color to this stately stone façade. 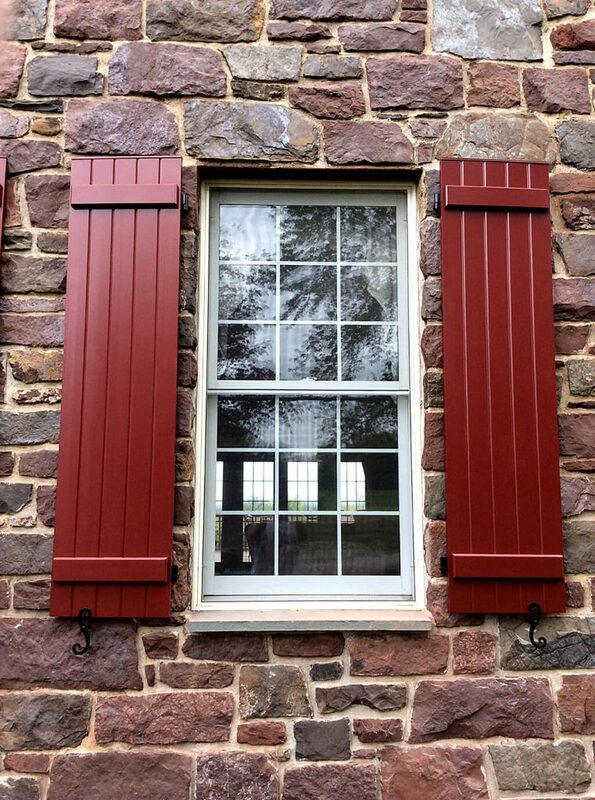 Perfectly fitted red board & batten shutters allow these homeowners to use their shutters as they were traditionally designed to function. 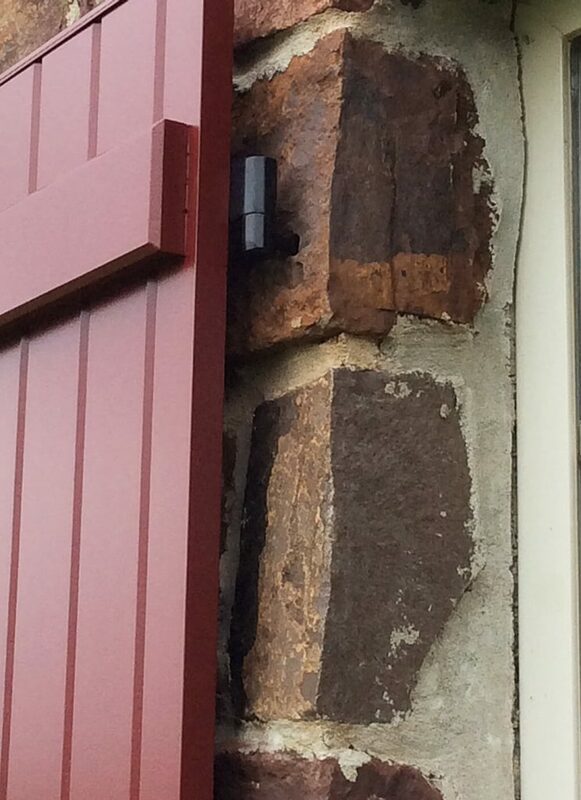 A detail shot shows our Heavy Duty Lag Pintel, a great choice for operable shutter mounting in thick, stone façades. 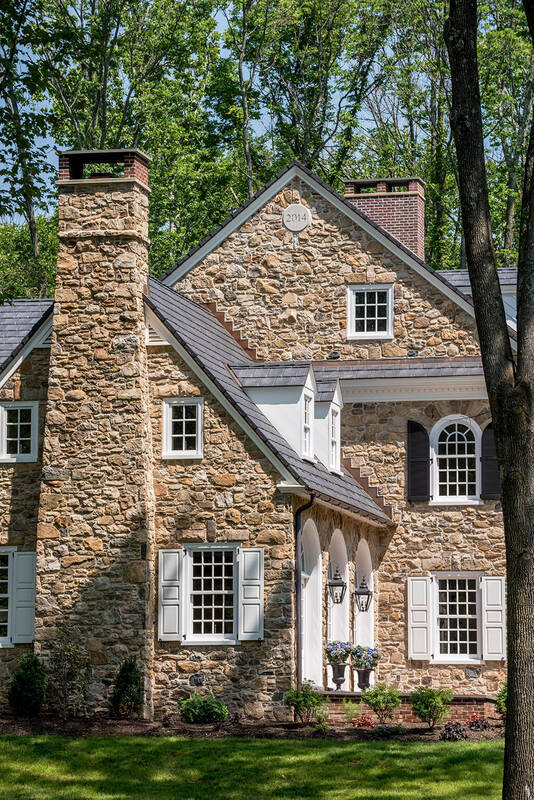 A rustic stone home with Timberlane’s Endurian Shutters in a 50/50 configuration with Shaker panels, finished with complete hardware, including “S” bevel tiebacks, pull rings, and slide bolts. 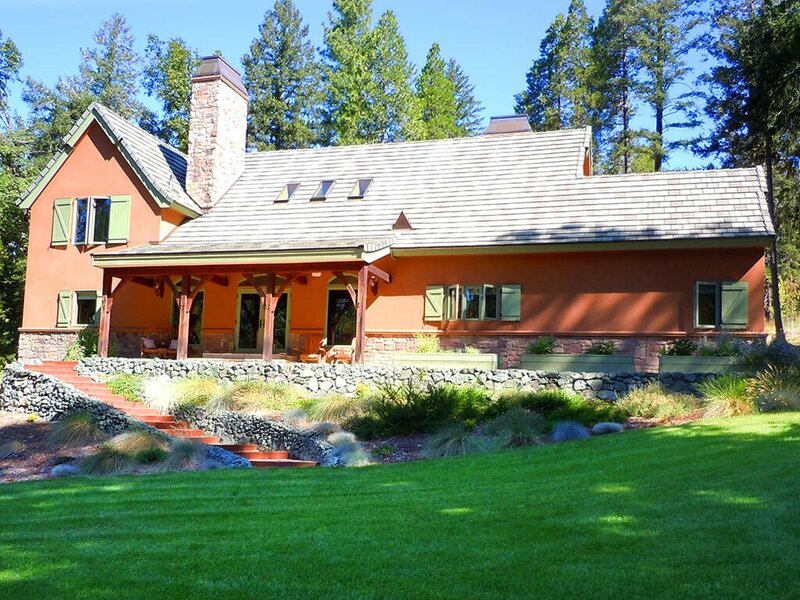 This home sports a lively palette with orange exterior paint, stone details, and custom green board and batten shutters with Z-brace detail and operable installation. This lovely stone building is perfectly matched with operable louver shutters on the second story anf raised panels on the ground floor, both painted Blue Lagoon. 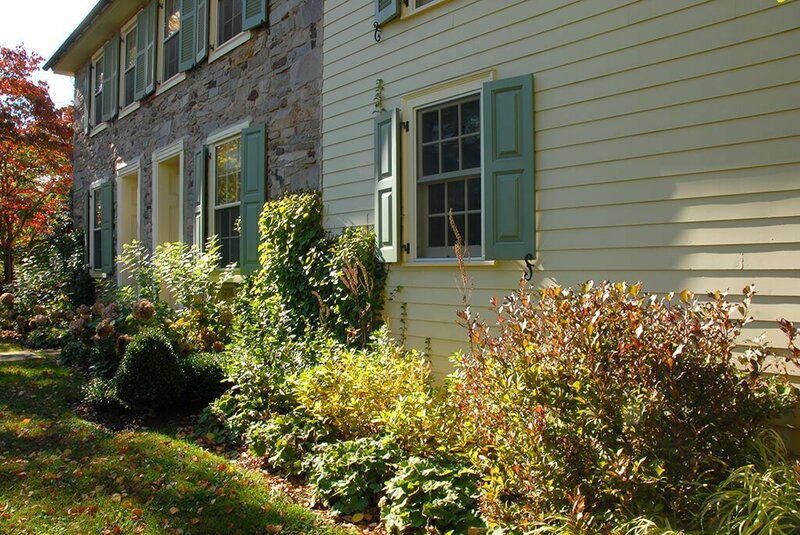 This Ambler Inn maintains its historical legacy with authentic shutters in both operable louver and panel styles across its façade. 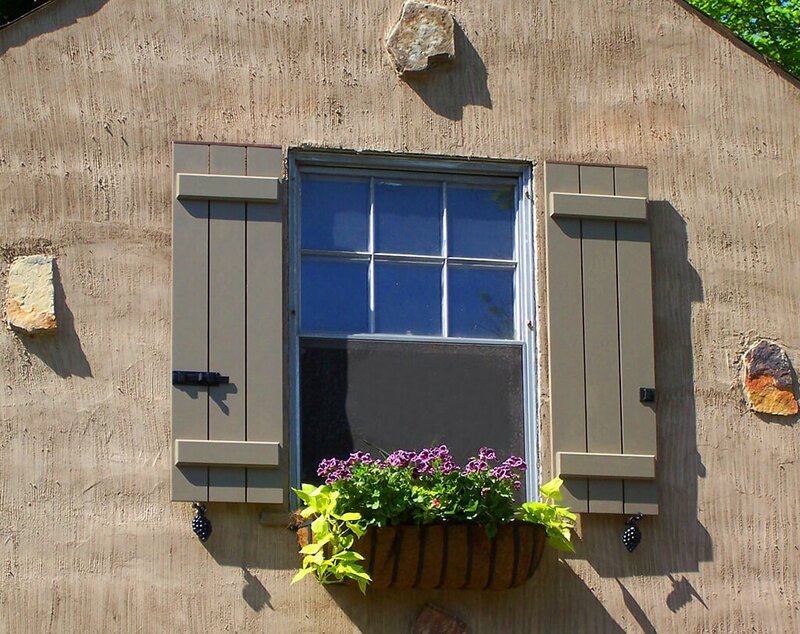 A planter in bloom and rustic board & batten shutters make for picture-perfect windows. 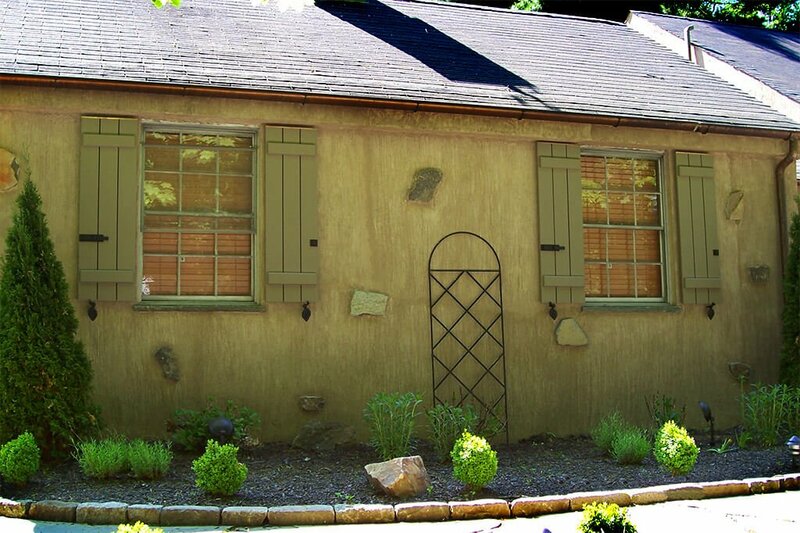 These olive green board & batten shutters are accented perfectly with our slide bolts and grape bunch tiebacks. 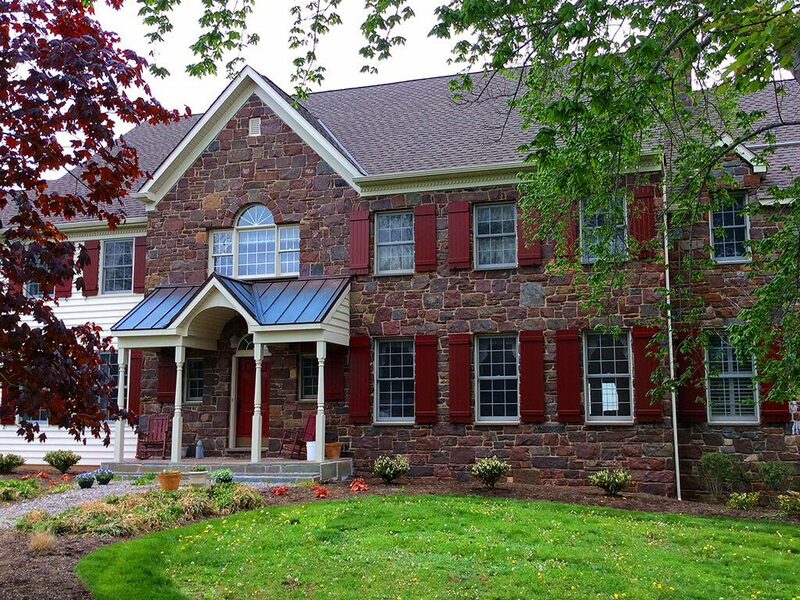 These lovely stained stained panel shutters, in 30/30/30 configuration, displays the wood’s natural colors and grain texture in contrast to the brick red face of the home.